It's Day 4 of the 7th Annual Flats and Handwashing Challenge! If you're new to the Challenge, please read more about what's going on this week as families all over the world will be diapering their babies with flat diapers and handwashing for a whole week. Today's topic is to share your wash routine. The easy part of the Challenge is actually using flat diapers. But washing them with no machine is the harder part. Participants are not allowed to use their electric washer and dryer and instead must handwash their diapers. To me, the hardest part about handwashing is talking yourself into doing it at the end of a long day. It's best to handwash daily because the more diapers you have to wash, the more of a chore it is! Here's what's working for me to get my diapers clean this week. I'm storing my diapers in a diaper pail with no liner or wet bag. It's just easiest to be able to rinse out my pail at the end of the day and not have one more thing to wash. As far as the actual pail goes, it's just a small kitchen trash can from Walmart. Nothing fancy here! I'm choosing to handwash my cloth diapers once or twice a day. 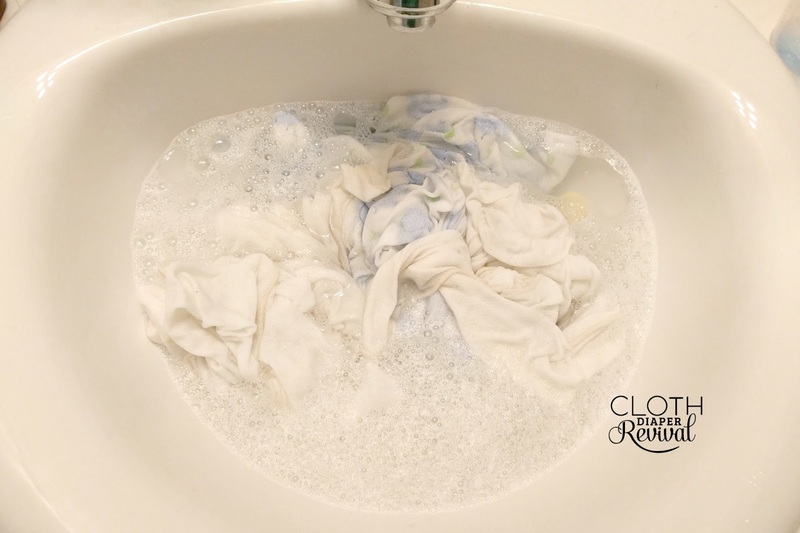 I like the idea of washing once, but some days my baby uses more diapers than others and my timing works out that I'm able to wash in the morning and in the evening. I'm using my sink to physically handwash my diapers. In the past I've used the bath tub, but the sink is easier on my back. One key feature for me is being able to use my diaper sprayer. Many people are taking the Challenge without using one, but for me it really helps. I'm able to spray out all diapers before throwing them in the pail which helps cut down on some of the hand rinsing and helps me to get them clean. I run warm/hot water (warm enough to get them rinsed well, but not so hot that my hands can't stand the heat). Each flat is individually unfolded and rinsed/wrung out under the faucet. I fill my sink with the warm/hot water and add a splash of detergent. I have found that I don't need a ton of detergent to get 5-6 diapers clean in a small sink full of water. In fact, using too much detergent can be such a handful when handwashing because it takes so many rinses to get the soap out. I'm using my regular detergent, I believe it's Arm and Hammer. I put all of my flats (5-6 max), my covers (2-3) and any cloth wipes I have used in the sink. Using both hands I massaged and squeeze the pile of laundry quite a few times. Then I work individually on each item, squeezing, scrubbing together, working the water in and out of the item. Once I have done this with each item, I squeeze out all of the water and drain the sink. I turn my faucet on with warm/hot water and individually rinse out each item, wringing and squeezing out any soapy water that's left. Individually, I squeeze and wring out as much of the water as I can by hand. This can take a little muscle and is a great workout! Line drying outside is my absolute favorite way to dry flat cloth diapers. It's fast and diapers look so pretty on a line! Plus the sun is awesome gor getting out any stains that may be left behind. 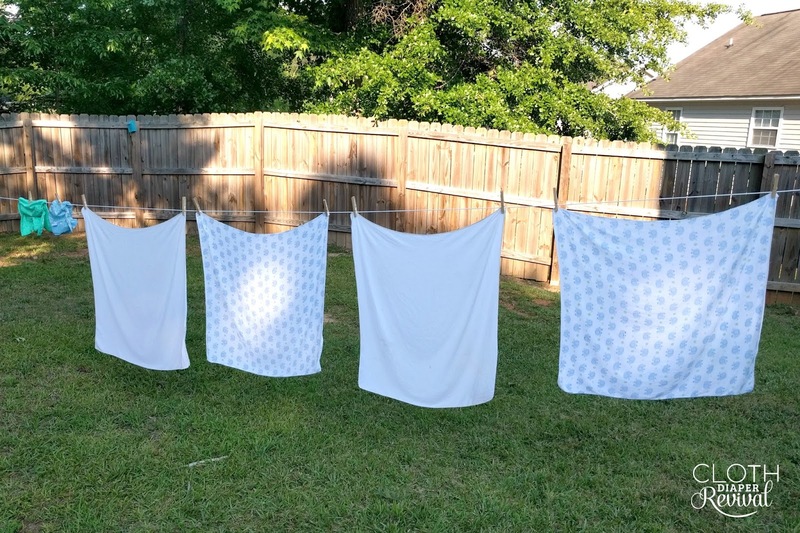 I use a retractable clothesline (affiliate link) in my backyard for outside drying. On rainy days or days that I wasn't able to handwash until nighttime, I use my indoor drying rack from Ikea. It's large and folds up so nicely. Definitely a great investment! I individually snap the water out of each flat. You'd be surprised how much water is left in them even after wringing them out by hand. After snapping, I pin them to the line. On a bright, sunny day, my flats can be dry in less than an hour! If I wait until later in the day when the sun is going down and there's more shade they take a few more hours. Inside drying takes longer, but they are always dry by the morning. Overall, the whole process takes 30 minutes or less for one load. It's totally doable and a great option for anyone that doesn't have access to a washing machine. Sure, it's work and it's one more thing on your to-do list, but if it's the only way you can make diapering your baby work, it's a feasible option. This is just one way to handwash your diapers! Some families are using a camp style washer, a wash board, and more! Check out the #flatschallenge hashtag on Facebook and Instagram to see what's working for other families and be sure to hop around on the links below.